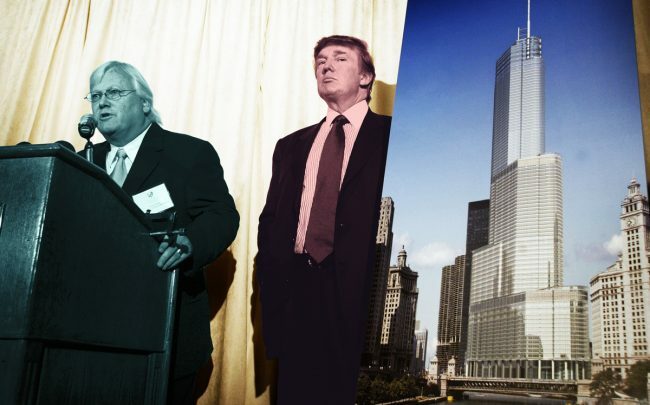 About a year before the 2005 groundbreaking for Trump International Hotel & Tower, Trump Organization executive Charles Reiss met the late Chicago real estate broker Bruce Kaplan and his colleague, Leslie Karr. 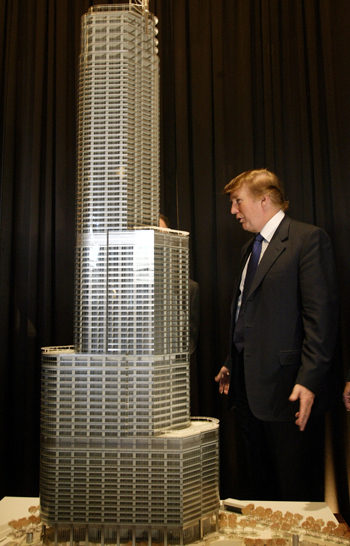 The Trump family, Reiss said, wanted advice on how to market the retail space that would face the Chicago River at the tower’s base. “The way it’s designed now, it’s never going to lease up,” Karr recalls telling Reiss. The roughly 70,000-square-foot deck’s 10-foot ceilings, undulating facade and sunken location would be too awkward to attract customers, she said. Just reaching the space requires detailed directions. At the north end of the Wabash Avenue bridge, a tiled stairway dips down from the sidewalk and beyond the sight of passing pedestrians. Once you reach the bottom, the path gives way to a row of metallic columns rising like Sequoia trees five stories up to the hotel lobby, interrupting an otherwise unobstructed view of the river. These efforts have proven futile: In 2018 alone, the tower’s leasing brokers, RKF and ARC Real Estate, spoke with at least 77 potential tenants — mostly cafe and restaurant operators — to discuss a potential lease, according to the tax appeal documents. All said no. 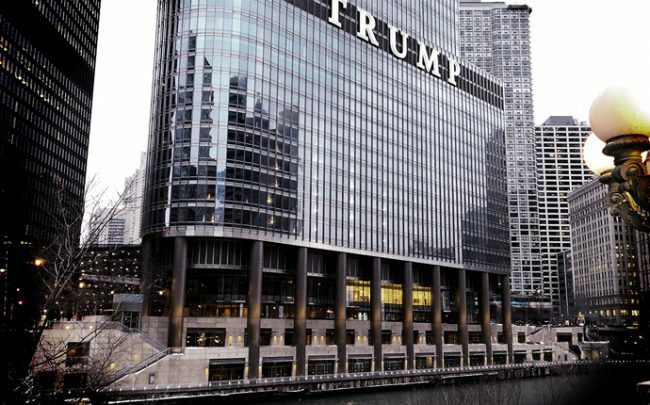 The Trump Organization did not respond to requests for comment for this story, nor did the city of Chicago’s Department of Planning and Development. The tower’s current leasing broker, ARC Real Estate, declined to comment. In an interview Wednesday, Reiss, who left the Trump Organization in July 2004 and is now an independent new-development consultant, said he didn’t recall ever having met Karr. He said the retail space’s unconventional design was necessary to conform to the city’s zoning requirements, which mandated accessible space along the river. The lead architect for the tower, Adrian Smith, of Skidmore, Owings & Merrill, didn’t respond to a request for comment for this story. But in his 2007 book, “The Architecture of Adrian Smith, SOM,” he outlined his vision for the building. 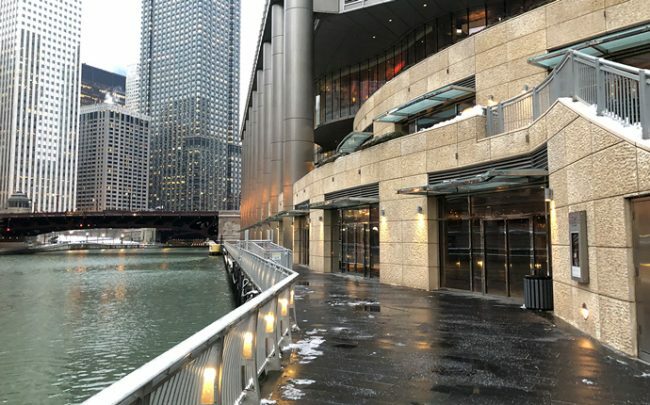 When the 98-story hotel and condominium tower had just opened in 2009, the Trump Organization branded the double-deck riverwalk as “luxury retail” and sought net rents between $100 and $150 per square foot, according to multiple leasing brokers. That’s on par with outlets facing the Magnificent Mile, Chicago’s most glamorous stretch of shopping. CBRE, the first leasing brokers on the project, kicked off the marketing campaign by inviting high-end merchants to join one of the most trafficked shopping destinations in the country. The pitch didn’t land. For now, the continued loss from the retail space mainly serves as justification for a lower property tax bill, the tax appeal documents show. Last year, tax attorneys representing the developer estimated the space’s value at just $23.33 per square foot, citing average area rents from a 2018 CBRE report. The estimate is on par with second-floor retail leases in River North, or ground-level spaces in the Bronzeville neighborhood, Karr said. Former Cook County Assessor Joe Berrios agreed to cut the property’s assessed value by about half last year, saving Trump about $500,000 in property taxes, county records show. Attorneys for the property appealed again, but the Cook County Board of Review did not grant another reduction. According to their appeal to the board, brokers were in talks with five prospective tenants: two office users, a restaurant, a grocer, and a private school operator. The highest offers came from the office users, who discussed paying $40 per square foot in gross rent but ultimately didn’t sign. The grocer was in discussions to lease 28,000 square feet on the upper level at a gross rent of $30 per square foot but backed out. The restaurant group also walked away, saying it needed 22-foot ceiling heights. More than 20 prospective tenants last year cited the space’s design or the location’s lack of visibility in their decisions not to sign a lease, the tax documents show. “The common thread among these lost opportunities was that prospective tenants decided that the property’s layout, location, and or accessibility kept them from entering into a lease,” the Trump attorneys wrote. But they added that brokers are now in “advanced negotiations” with a tenant that could take 67,700 square feet, or about 96 percent of the deck space. The attorneys estimated the retail’s potential net revenue around $1.7 million for 2018. At that amount, the Trump Organization would have lost out on more than $17 million in potential revenue since the building’s opening. And if the building had ever leased at the $100-plus rents the Trump Organization once hoped for, the money left on the table is multiples of that. The loss puts a sizable dent in the Trump Organization’s annual income for the tower, which President Trump reported in an ethics disclosure tallied $8 million in 2017. The double-deck retail space is most clearly seen from the Wabash Avenue bridge overlooking the Chicago River. The bottom gives way to a row of metallic columns stretching up to the hotel lobby, interrupting an otherwise unobstructed view of the river. 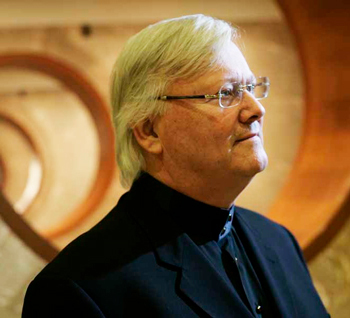 Architect Adrian Smith wrote that he designed the curving storefronts to "eliminate any visual reflective distortion." 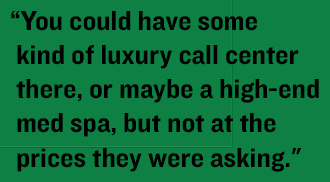 But retail brokers say they block sight lines, making it harder for potential tenants to woo customers. A honeycomb of staircases links the the Trump Tower retail deck with the Wrigley Building plaza on the east side of the property. 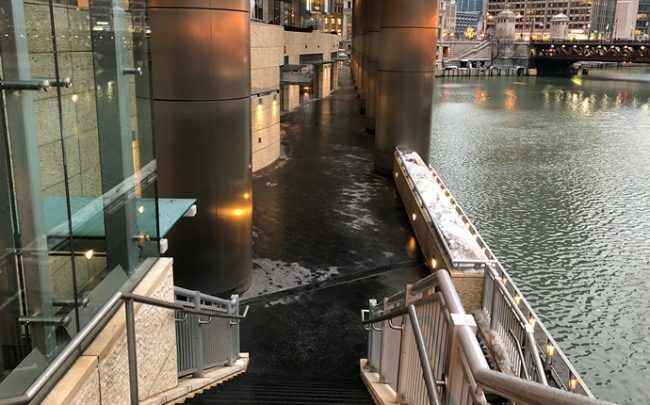 The riverwalk-level storefront facades are straight, but the path is narrower than the terrace level above. Frosted glass awnings jut out from above each door. 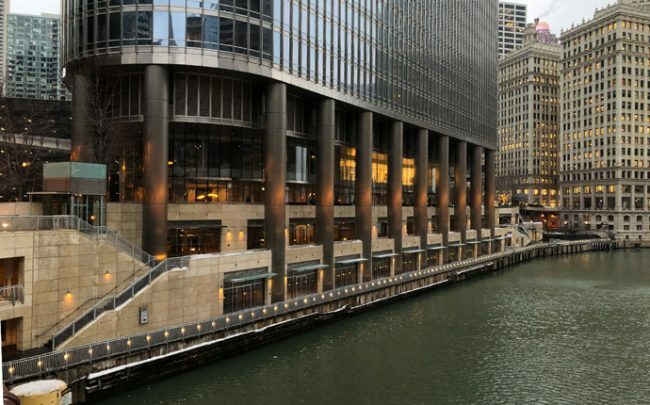 The decade-long vacancy sets a record for Downtown Chicago’s retail market in the modern era, according to Colliers International. No other retail site larger than 5,000 square feet has sat on the market for this long. The next-longest vacancy, though, can be found next door to Trump Tower, where a 8,700-square-foot space at the Wrigley Building plaza had sat empty for more than nine years before chocolatier Ghirardelli leased it in 2014, following a $91 million renovation of the tower by then-owner BDT Capital Partners. A 5,160-square-foot storefront has sat vacant at 871 North Rush Street since 2010, and a below-grade retail space has been empty since it was built in 2011 at 333 East Benton Place in the Lakeshore East area, according to Colliers. The Benton Place spot and the Trump Tower deck share a key handicap: they can’t be directly accessed from the street. Sometimes that can be enough to stymie a property’s leasing efforts, according to Gregory Kirsch, head of Midwest retail for Cushman & Wakefield. The Trump Tower retail space, Kirsch added, is especially hard to access. The design’s emphasis on outdoor deck space was also a miscalculation in a city where inclement weather keeps people indoors half the year, multiple brokers said. Consider that at the Riverwalk, a new city-owned esplanade on the south side of the river, several food-and-beverage vendors pay the city fees amounting to $10 per square foot or less, in a nod to their seasonal use, city contracts show. The Trump Tower retail space is among several underachievers in a Chicago submarket where vacancies are rising. Beacon Tavern, a 4,200-square foot-seafood restaurant behind Trump Tower at 405 North Wabash Avenue, swells with tourists and office workers during happy hour most weekdays. At $65 a square foot in net rent, it’s been a boon for Mark Goodman, who owns the retail component of 405 North Wabash. 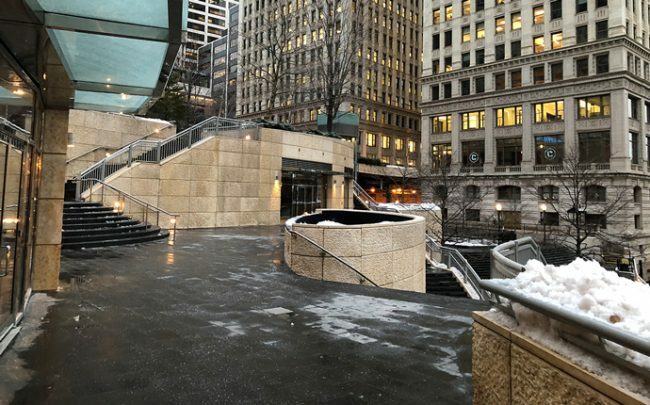 But another 5,200 square feet of retail space inside the same building, which faces a grade-level plaza between Wabash and Michigan avenues, has sat vacant for at least a year. 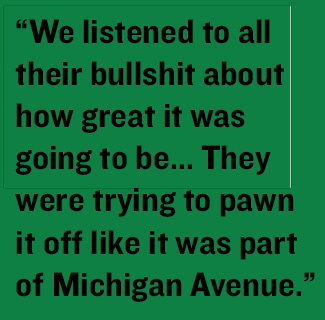 Retailers aren’t faring much better around the corner on Michigan, Goodman said. Vacancies are piling up, now that e-commerce has taken the luster off what was once highly coveted real estate for outlet stores. 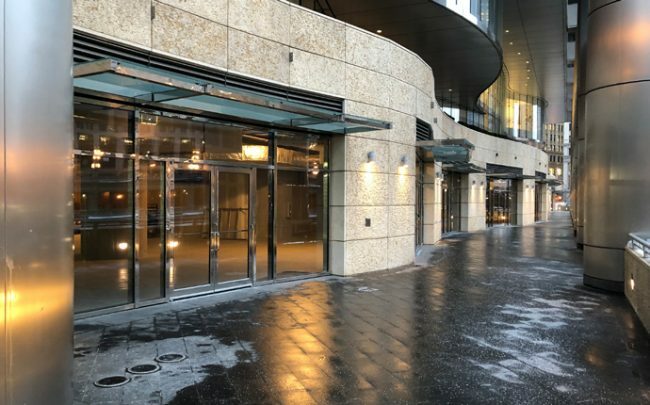 Even for a visible retailer with an inviting design, the Magnificent Mile area is not as promising as it once was, he said. 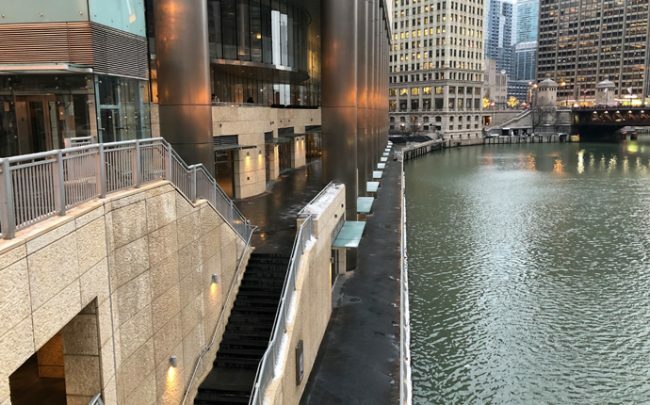 Merchants are hoping foot traffic picks up as new apartment and condo towers, like CIM Group’s redeveloped Tribune Tower and the supertall it plans next door, sprout up along the north branch of the river. Belgravia Group is now marketing its 50-unit Renelle on the River condo building just north of Trump Tower. The new neighbors could be potential shoppers for the Trump retail deck, Belgravia principal Alan Lev said. 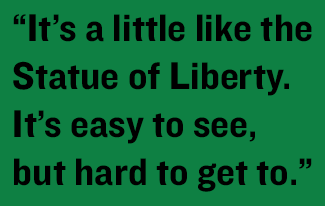 But first, they would have to find it.